The Forza Racing Championship has returned! 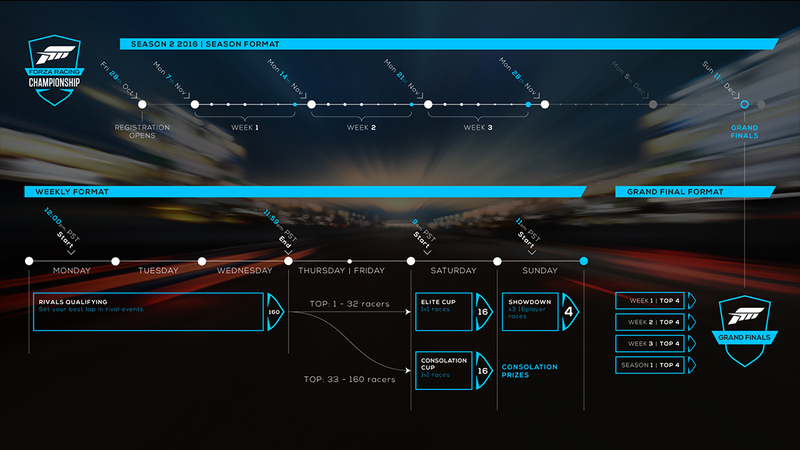 Following a thrilling first season of competition, registration is now open on the ESL website for Season 2 of the official ForzaRC esports series. Sponsored by Michelin, Logitech G and Playseat, and starting November 7, Season 2 players worldwide will compete for cash and prizes worth more than $150,000. For the first time in the ForzaRC series history, the events will take place across two Forza games - Forza Horizon 3 and Forza Motorsport 6. 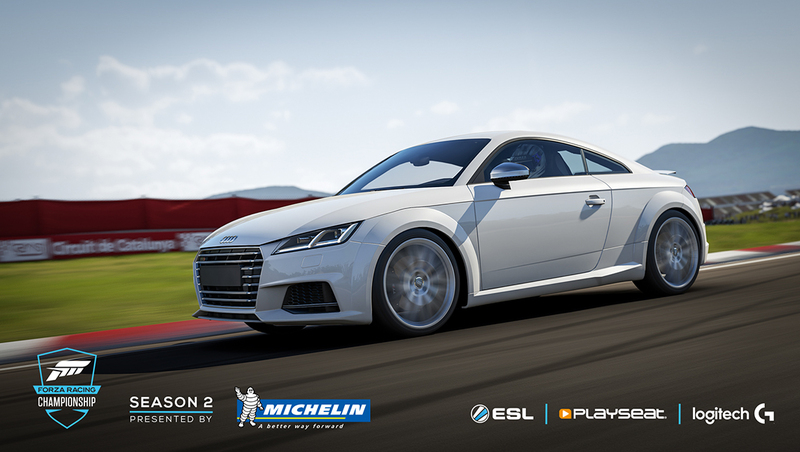 Building on the success of the inaugural season of Forza Racing Championship, Season 2 will bring players of all skill levels together to experience state-of-the-art racing and fun competition through two unique race series. Each week, four Semi-Finals winners will move on to the Season 2 Elite Series Grand Finals, which will be broadcast live from ESL’s studios in Burbank, CA on Sunday, December 11. 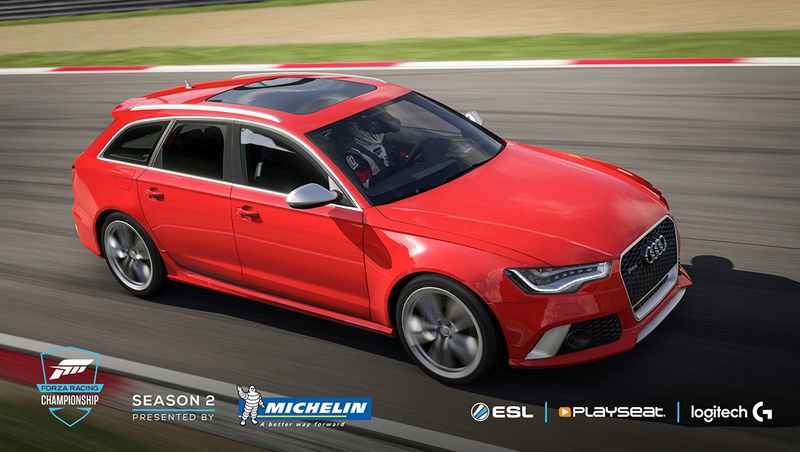 The ForzaRC Recreation Series will be held in both Forza Horizon 3 and Forza Motorsport 6. Starting today (10/28) and over the next seven weeks, players can compete in the Recreation Series by setting a time in special ForzaRC Rivals events created in Forza Horizon 3 and in Forza 6. Players will have a chance to win exciting Horizon Edition cars in Forza Horizon 3 that are currently unavailable by any other means. The ForzaRC Season 2 Elite Series is comprised of three weeks of competitive play in Forza Motorsport 6, beginning on November 7. The three weekly Semi Finals series will start each Monday with a custom Rivals Qualifier event. 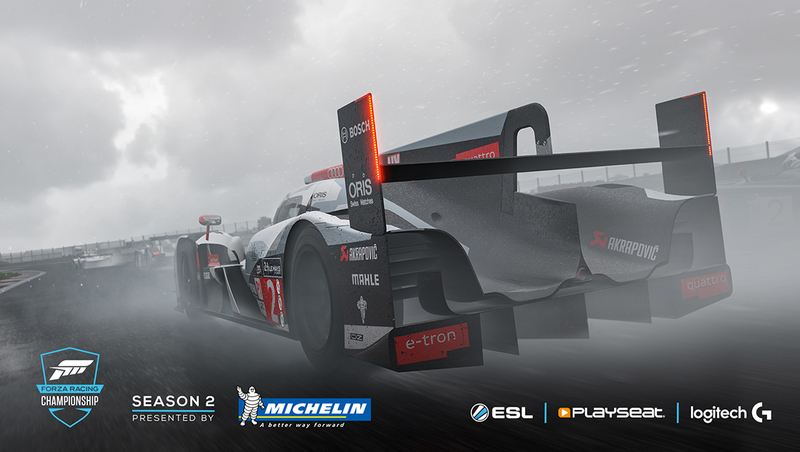 For Season 2, ForzaRC Rivals events will open on Monday and close on Wednesday. Once the weekly Elite Series Rivals qualifier is complete, the top 160 registered and eligible players on the Rivals leaderboard will move on to the next stage of competition. The top 32 eligible players will qualify into the Elite Series Cup, which will be held weekly on Saturday. The Elite Series Cups will be 1v1 races, where players will compete to be one of 16 players that move on to the weekly Elite Series Showdown, which will be broadcast live. From each weekly Elite Series Showdown, four players will move on to the Elite Series Grand Finals, which will be broadcast on December 11. The remaining 33-160 players from each week’s Elite Series Rivals qualifier will move on to a special Elite Series Consolation Cup, which will take place weekly on Saturdays. The Consolation Cup will feature 1v1 races as well, and the Top 16 players from the Consolation Cup will each win cash prizes. To be eligible to compete in any of the Elite Series Cups and win prizes, players must be registered. For more details on eligibility requirements and registration, see the official Forza Racing Championship Season 2 Elite Series rules. The ForzaRC Season 2 Recreation Series is comprised of seven weeks of competitive play in Forza Horizon 3 and Forza Motorsport 6 beginning on October 28. Registered and eligible players can win prizes by setting a time in each week’s unique ForzaRC Recreation Rivals Event, which will be found in the “Monthly Rivals” channel in Forza Horizon 3 and Forza Motorsport 6. Prizes will be awarded to eligible players based on their performance in each week’s Recreation events. In addition, all players will have a chance to earn a special edition car in Forza Horizon 3 just for taking part each week, as well as another bonus car in Forza Horizon 3 for setting a time in all seven events. 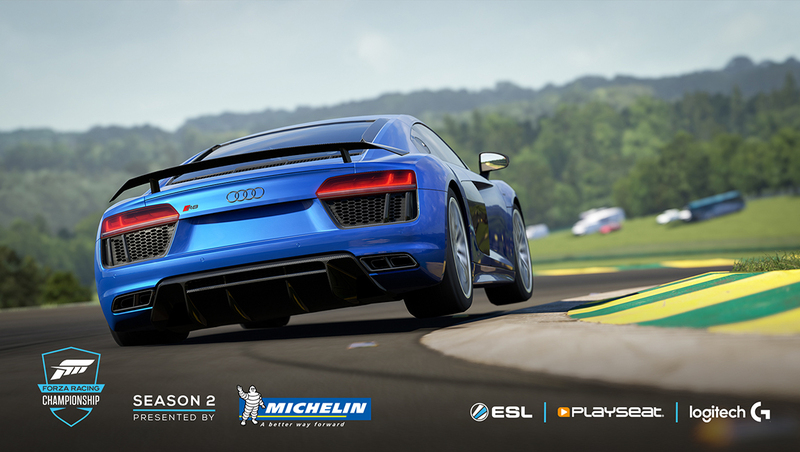 Registered and eligible players in the ForzaRC Season 2 Recreation Series will have a chance to win cash prizes, depending on their performance on the weekly Recreation Series Rivals event leaderboard. Here’s a look at how the prizing breaks down. Set a time in all seven weekly events – 1977 Aston Martin V8 Vantage w/custom Forza Racing Championship livery. To be eligible to win physical prizes in the Recreation Series Cups, players must be registered. For more details on eligibility requirements and registration, see the official ForzaRCSeason 2 Recreation Series rules.